My husband decided to make homemade potato chips for a party at a friend's house back on Father's Day. We transported the chips in a brown paper shopping bag figuring it was the best way to keep them crisp. Instead of putting them in a bowl upon our arrival, I merely ripped the bag, rolled down the sides and tried to convince everybody it was just the kind of fun, rustic presentation Martha Stewart would do. It worked. 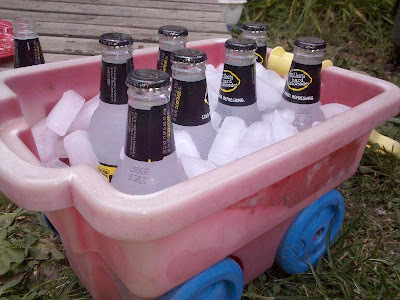 But then the hostess out Martha-ed me when she used her her kid's wagon to keep the booze cold.